Friday night we met up with Matt’s sister Britton and her husband Rob for some drinks and dinner at the High Spirits Lounge. Don’t judge us, this a bar inside a Holiday Inn, but it has some of the best views of city. Matt is a gold card member, meaning $1.50 glasses of wine and $3 liquor drinks. You can’t beat that! We had a great time catching up and hearing all about their recent honeymoon to South Africa. On Saturday we headed to Carson’s Second Birthday Party. Sadly I didn’t get any pictures of the birthday boy or my girl Caycee, but the party was amazing! Caycee did an awesome job putting everything together. She had a huge jump castle out back, that Matt and Sterling enjoyed! Sterling eating all the birthday boy’s toys! After the birthday party we headed over to our friends, Alissa and Alec’s house for some homemade Beef Stew and delicious red wine! sounds like a great weekend. Scarlett is obsessed with toilets too! Natalie!! Thanks so much for making Carsons party we loved having you there!! !Also thanks for the adorable outfit, love it, which I knew I would ;)I love that picture of Sterling and Matt coming down the slide priceless!! What a fun weekend! 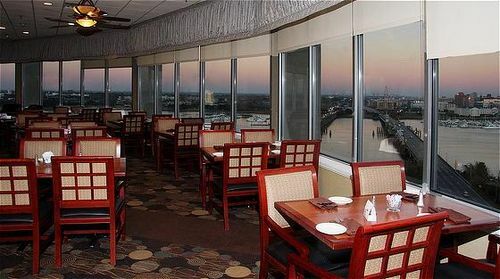 I may have to try convince T to go to the that Holiday Inn next time we're in Charleston – I bet it does have great views! I've never been up to that bar, great deals I'll have to check it out! I have always wanted to try out the high spirits lounge! Looks like a great weekend. i've actually never made it up to that bar. And look out Natalie, Lilly's into toilets too. Always make sure they're shut or you'll have an I want to vomit moment. I'm a fellow Charleston mom, & I've loved reading your blog for the past couple of months! New to your blog! I absolutely love the name Sterling! It's so unique! How funny that he is obsessed with toilets! As long as its clean water that he's sticking his hands in…don't forget to flush! Haha! : ) Y'all are an adorable family! Sounds like a perfect weekend! My husband and I went to South Africa on our honeymoon…what an amazing place. Your son has the same pj's as my son! I need to meet you on my visit to your city! I would love to have a cocktail there for $3.00!!! i can't wait to drink again! That Holiday Inn does have pretty good views 🙂 My parents used to always stay there when they came to visit! No judging. Your family is so adorable!!! So funny – my daughter went through a toilet love. Insanely gross! She wanted to put everything down it. Now, we are potty training so she no longer wants anything to do with it!